Our gold "Alleluia" letters, embellished with dogwood blossoms. My bi-fold "Saints Day" frame, with Easter themed pictures (I used drawings from Catholic Artworks). I explains the "legend" of the dogwood blossom. I'm not sure if it is true, but it is a beautiful story! I decided it would be fun to decorate the house with dogwood blossom garlands to carry out the theme throughout Eastertide. 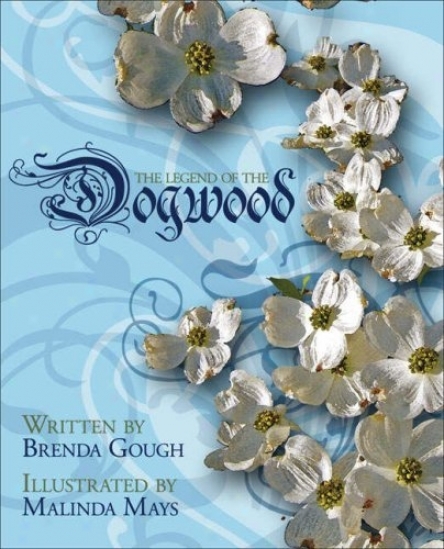 We may do some crafts based on the dogwood blossom legend too; there are some easy ones at Catholic Icing, Catholic Inspired and at JDaniel4's Mom. Wishing you a beautiful Eastertide! Cheryl, The empty tomb with the butterflies and peg dolls is breathtaking! What is it made of and did you make it yourself? The tomb is a rectangular box and some styrofoam packing from a computer box. I paper máched over them then painted with beige acrylic paint then "dabbed" shades of browns to get the look of rock. It sounds strange but I really felt like God was guiding my hand during the project since He knew it would be used in the CGS atrium and He wanted it to look a certain way for the children! (I was amazed at how it came out because I'm not particularly talented with paint.) I've had that experience a few times when making CGS materials. Have you ever experienced it when making materials? Your empty tomb is amazing! I was going to ask how you made it and then saw your response. That would have looked good on my prayer table :) I'll have to remember that for next year. Your dogwood flowers on the crown are just lovely!